Rythmia was a life changing experience for me. It is by far the best and most comprehensive wellness resort I have ever experienced. Yoga, meditation, breathing classes, ayahuasca plant medicine, personal development classes, this place had it all. The staff, service and accommodations were lovely, and the grounds pristine. All organic buffet style food with tons of choices at every meal. The first thing I asked for was their cookbook! I highly recommend and I will definitely return. Room Tip: I stayed in a private room. My room was amazing. The shared rooms were really great too. An all-inclusive, medically licensed luxury medical center and wellness retreat in Costa Rica. Rythmia Life Advancement Center is a full-service, short-stay, licensed medical center, specializing in plant-based alternative therapies. If you are participating in the Rythmic Breathing program, there are some things we need you to understand prior to your arrival. Please bring your Rythmic Breathing medicine fee of $399. That fixed fee of $399 will cover your Rythmic breathing costs for four appointments within the Rythmic Breathing program. The fee for Rythmic Breathing is due to the medical company on-site at the resort. Please send the name and phone number of an emergency contact. Rythmia Life Advancement Center is a medically licensed life transformation center situated in Guanacaste Costa Rica, our areas of focus are, drug and alcohol addiction, general health and wellness and spiritual development. 1. (Recommended) If you would like to take full advantage of the round trip shuttle service from Liberia or Tamarindo airport, please provide us with your air travel itinerary so we are clear on your originating city, airline, flight number and arrival date and time into Liberia. 2. If you would like to be picked up from the Hilton Garden Inn, the standard time for pickup is 11AM. 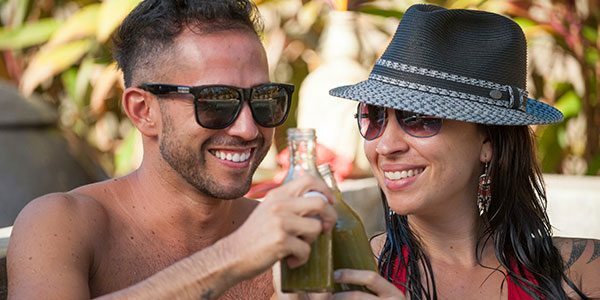 If you would like to be picked up in Tamarindo, please let us know an ideal time frame so we can accommodate you via our current shuttle routes to and from the airport. 3. If you are driving directly to the resort or taking a cab, we will still need to understand your anticipated date and time of arrival at the resort so we can advise security at the gate. Please call +1 888.825.3344 or email us arrivals@rythmia.com at least 72 hours prior to your expected arrival at the resort. If we don’t confirm your itinerary at least 72 hours before your arrival, we cannot guarantee shuttle pick-up or immediate access for check-in at the resort. Need help booking your flight? Please call us at +1(888) 825-3344. Welcome to the Rythmia Herbal Support Therapy Program! If you are reading this document, it means that you have been given the all clear by our medical staff to attend the Herbal Support Therapy Sessions. Drink 2 liters of water daily to stay hydrated and to assist the cleansing action of the program. It is recommended that Guests avoid using strong smelling fragrances and strong commercial body products during the program. It is recommended that Guests avoid any sexual activity during their work within the Herbal Support Therapy Program. This is to maintain your body’s own healing energy so that it may better sustain you through the healing journey. Please follow these guidelines for 3 days prior to taking the medicine, while taking the medicine, and also for 3 days after taking the medicine. Guests on the Herbal Support Therapy Program are encouraged to limit the amount of time they spend on the Internet and watching TV. Rather, fill your mind with positive and uplifting/spiritual messages and images to better sustain you through your healing journey. There is a group Herbal Support Therapy Integration meeting every afternoon. This is your opportunity to ask questions, and talk about your experiences and insight, which is an important part of your process! *During the Herbal Support Therapy sessions, please wear loose fitting, light-colored, comfortable clothing. **Ladies please let us know if you are on your period. No eating after 2pm (have a light lunch), and no juices or coconut water after 4pm. If you are participating in the Herbal Support Therapy program, there are some things we need you to understand prior to your arrival. Please bring your plant medicine fee of $399. That fixed fee of $399 will cover your plant medicine for four medical appointments within the Herbal Support Therapy program. The fee for medicine is due to the medical company on-site at the resort. Additional medical appointments are available within the Herbal Support Therapy program for a fixed fee of $99 per medical appointment within the Herbal Support Therapy program. Our guests receive discounted rates. Dr, Nurse and Psychotherapists on staff delivering cutting edge medical modalities and plant-based therapies. 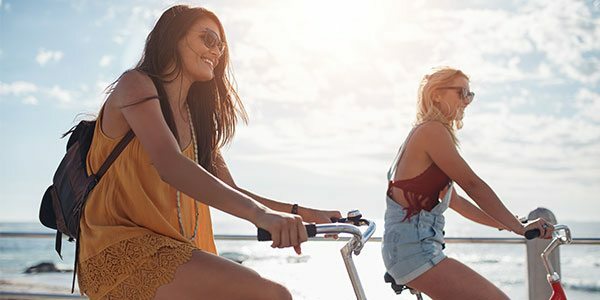 Over 40 bikes onsite for guests use for riding off property to nearby sites or a quick pedal over to the beach (less than 10 minutes). We have the most complete and safe colon hydrotherapy treatment in the world for cleansing the internal organs and digestive system. Removing waste from the large intestine activates your body’s natural ability to heal itself. Our life coaches will address specific conditions and transitions in your life, by examining what is going on right now, discovering what your obstacles or challenges might be, and co-creating a course of action to guide you towards the life you aspire to have. 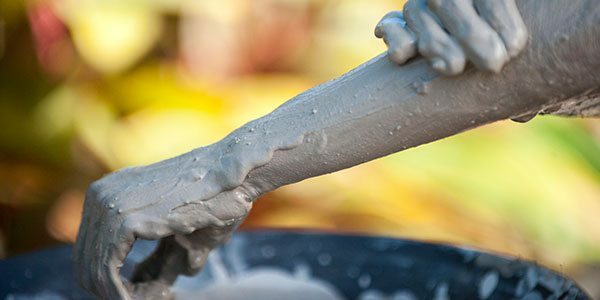 Draw out the toxins and impurities from your body as the volcanic ash exfoliates to soften your skin. Healing touch practitioners use essential oils during your massage in private treatment rooms. Your week includes 1 one-hour massage. Additional massages are available for a fee. Relax in the steam room or geothermal water jacuzzi with jets to invigorate your circulation. The Eco natural landscape provides for a peaceful experience. 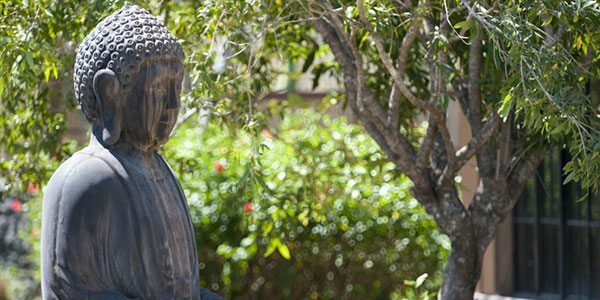 Choose to meditate alone in front of the labyrinth or many buddha’s or join the group for a guided meditation with one of our shaman’s. 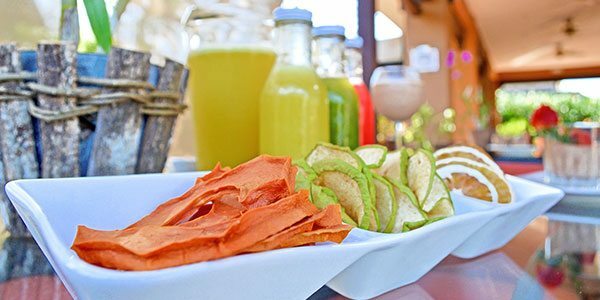 Fresh juices created by our Nutritarian are a combination of local market fresh fruits and vegetables served during meal times. Also available is a Juice Program, for an additional $20 per day. Examples include an energizing Green Jolt Juice or body nourishing Blood Builder Juice. We are committed to locally sourced, farm-to-table organic food and provide our guests with three meals a day. Our Nutritarian presents foods that are of the highest vibration, innovative and creative, and of course nutritious and healthy. Taita Juanito joins the traditions of his Inga bloodline with the Siona tradition he received from Taita Laureano. Taita Juanito is a well-known and respected teacher, he has followers throughout the world, and people flock to him due to his compassionate heart and great wisdom. He is always willing to share his guidance with those that are interested in following the path of sacred medicines. Taita Juanito has a Spiritual Healing Center on the outside of Bogotá called Finca Ambiwasi (House of Healing). He travels to Costa Rica on a regular basis to share his medicine and knowledge with his students. Steve has a bachelors degree in Health Science and a Masters Degree in Occupational Therapy. He spent 15 years working with children and adults with physical and cognitve difficulties. In 2015, Steve began working with plant medicines in Cusco, Peru. Working alongside the Myburgh family for a year he gained a deep understanding of traditional medicine and ceremony work. Jaya Tara Devi has been in the holistic health and spiritual exploratory fields for over 20 years. She offers a wide range of opening pathways to consciousness through connecting ancient traditions along with cosmic modern information that is grounded in these times. The practices and teachings she shares have roots in yoga, shamanism, Tantra, meditation, bodywork, Ayurveda, spiritual psychology, herbology, sacred plants and whole foods nutrition. She has studied with several modern day masters since the age of 17 years old, including traveling around the world sharing in these teachings. Brad Recktenwall is an Herbal Support Therapist who works closely with each guest at Rythmia. Brad has years of training in plant medicine, and studied under the leading experts in Africa among diverse flora and fauna jungle environments. Brad’s experience enables him to facilitate exceptional herbal support therapy sessions with guests, while he creates a safe and therapeutic environment. Those who attend Brad’s sessions are able to process deep emotional and spiritual issues as they work toward self-connection and enlightenment. Brad brings a wealth of knowledge to Rythmia that he uses to support guests while they venture into areas of self-reflection and change. Brad’s calm demeanor is complemented with great strength and insight, which guides and encourages guests to seek their own truth and find peace. As an expert in addiction therapy, Brad is able to connect with guests who are struggling with a variety of issues. His belief that “each person is their own teacher” empowers and gives confidence to guests who learn to seek the answers for life within their own souls. Gerard Powell was the personification of the American businessman: rich, powerful and unhappy. He opted to try anything available to hide from himself and his “perfect” life. Most of his existence he suffered from addiction and depression, incessantly trying to fill the hole deep within, with little or no success. Ultimately, after much trial and error he found the key to true success and happiness. Today, he serves as a conscious entrepreneur, thought leader, philanthropist and public speaker on a mission to share the modalities and philosophies that transformed his life. His business history is nothing short of miraculous. He grew up in a very modest home, was not able to focus on school and ultimately dropped out. After several unsuccessful business ventures, in 1991 he partnered in a building and development company. His inner guidance directed him to discontinue this line of work , however Gerard remained involved long enough to consummate a deal that netted him more than a million dollars – while still in his twenties. Gerard went on to build multiple companies from the ground up later selling them for hundreds of millions of dollars. In 1995, Powell started thatlook.com, the first company organized to provide mass-market access to cosmetic surgery procedures. In 1999, Powell took thatlook.com public, and the company achieved a market value of approximately $150 million. 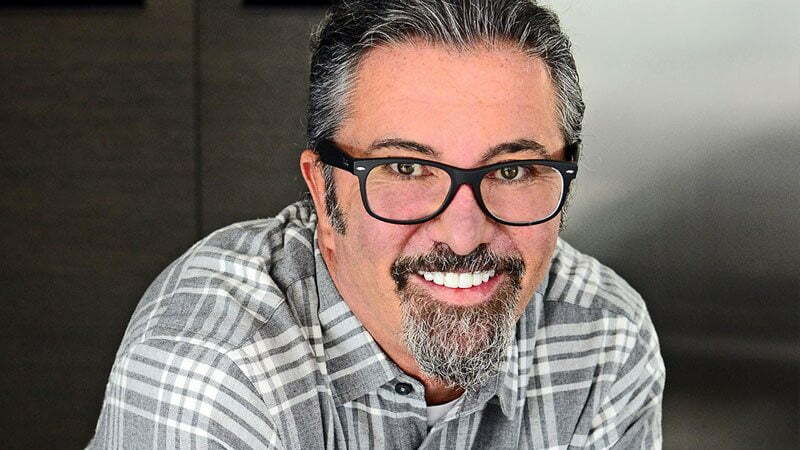 Subsequently, he and his management team founded looksforless.com mimicking and exceeding the same business success with a different business model. He was living the good life – too good, in fact. That is how Rythmia Life Advancement Center was conceived. Rythmia Group, Inc., a management company that manages certain aspects of the center, is headquartered in the beachside community of, Malibu, California, where Gerard also lives with his family. He visited Costa Rica and found the current location of the Center in Guanacoste, one of the five blue zones in the world where people live happiest and longest. He purchased an 81 bed hotel and renovated it making it the go-to facility for a spiritually awakening vacation experience poised to enable guests to experience healing and life transformation during their stay. Another way in which he has opted to share his experiences and findings is through Truthenomics, a program and website that teaches the skills and insights essential to a life of manifestation. He has become a leading Conscious Entrepreneur, creating progressive businesses that transform people’s lives. He speaks to audiences and organizations relying on his signature, unfiltered style that is filled with humor, authenticity and an inherent ability to inspire. Rythmia and Gerry’s story are featured in a just-released documentary entitled “The Reality of Truth” along with thought leaders including Joel Olsteen, Sri Sri Ravi Shankar, Deepak Chopra, Marianne Williamson and more, as well as actors Michelle Rodriguez and Peter Coyote. Dr. Jeff McNairy, Psy.D., M.P.H. has been working in the health care field for 25 years. He has worked in a variety of medical environments and seen the struggle individuals have when actually trying to heal. The current Western system of heath care is deficient in healing the population. It is more concerned with managing symptoms and using external sources for “change.” Through Dr. McNairy’s intense experience with the most desperate patient populations (addition, acute mental health, and trauma), he has seen that the only real healing can come from within. Meg is a “nutritarian”, passionate plant-pusher & conscious chef, yoga instructor, reiki practitioner, inspirational speaker, retired TV director, cookbook author, and eating disorder awareness advocate, with a personal mission to make the world a sweeter place, filled with love. 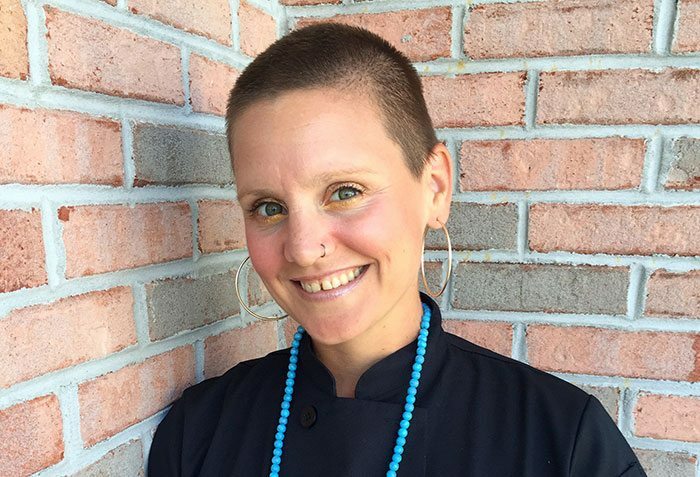 Meg is a certified Professional Plant-Based & Living Food Chef, food educator, and Culinary Nutrition Expert. Meg has also studied personally with raw food detox expert Natalia Rose at the Natalia Rose Institute in New York City as well as at Matthew Kenney’s M.A.K.E. Culinary Academy in Santa Monica California. Having worked in restaurants and the food industry all through her teens and twenties, and having grown up in her mother’s creative kitchen on a small farm in rural Ontario, Canada where meals were often based around local produce and comprised of comfort fare, Meg was surrounded with love from a strong family with hearty and healthy food philosophy. Even so, as a young adult Meg fought some serious food battles, suffering with anorexia and bulimia from her early teens. 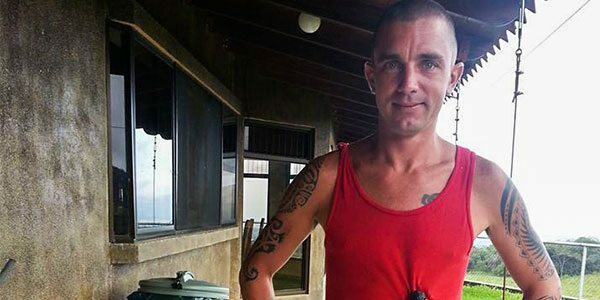 Over a decade of alcoholism, addiction and depression followed. After overcoming a series of life altering events in 2010 and 2011 that included the loss of her father to ALS, a personal bankruptcy, a failed engagement, her 6 year old nephews emergency brain surgery, and her own relapse in bulimia that resulted in a near death ER visit, Meg chose to take the leap and leave her 12 year career in live television production to pursue her passions: raw food & yoga. 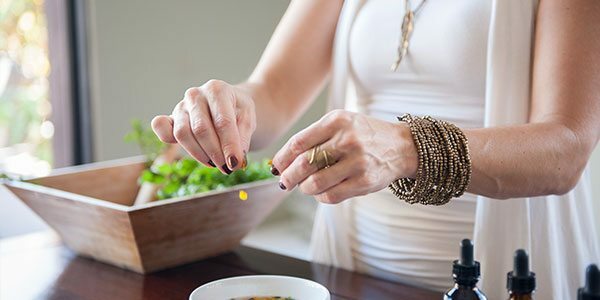 During recovery from her eating disorder and grief, she found comfort and strength in adopting a whole foods diet and also great satisfaction in being able to share her affection for food creativity with others. After spending several years sharing her knowledge and expertise in her longtime home of Toronto, in 2013 Meg packed her bags and moved to Costa Rica, where she has built a business catering wellness retreats, offering private chef services, and consulting with restaurants. Meg and her Costa Rican chef husband Isaack Mora also own the Nosara-based bakery, Bakers Dozen, where they create natural, vegan, and gluten free breads for local hotels, restaurants and markets. Rythmia’s yoga program propels our clients towards transforming their physical, mental, and spiritual lives. Yoga is a discipline known worldwide for it’s amazing mental, physical and spiritual benefits through its tandem use of exercise and meditative practice. The yogic practice has the potential to be an amazing tool for transformation, which is why we chose world famous specialist Shiva Rea to guide our yoga retreats and classes at our beautiful all-inclusive resort in Costa Rica. Yoga practice is a vital part of the everyday activities at Rythmia and we encourage all guests to take advantage. Our yoga sessions are designed for all levels, beginner to expert, with multiple classes occurring throughout the day and at times so that every guest, no matter the program, will be able to attend for no additional cost. Prana Vinyasa Flow Yoga is an energetic, creative, full-spectrum approach to embodying the flow of yoga cultivated by Shiva Rea and the Global Vinyasa Collective of Teachers. Students of all levels are empowered to experience prana – the universal source of breath, life-energy and conscious intelligence – as the navigating source of yoga practice and vital living. Practitioners learn classical and innovative approaches to vinyasa yoga and the state of flow drawn from Krishnamacharya’s teachings, Tantra, Ayurveda, Bhakti, Somatics and Shiva’s teaching experience from the last fifteen years. Rythmia is so dedicated to this part of your program that we have designed and built Yoga temples dedicated to your own practice. Classes will be occurring both in the morning and evening and are both great ways to either enter a day of healing or complete all that you have learned and experienced. Shivanter has been involved in the alternative therapies culture for over 30 years, working at the Omega Institute as Executive of the culinary division of the organization for over 15 years, Shivanter also supported launching Blue Spirit Retreat Center in Nosara, has consulted on the food concepts for The Bodhi Tree Yoga Retreat Center in Nosara, has also taught and facilitated cleanses at the Sivananda Ashram in the Bahamas, at Kripalu, Omega, Blue Spirit, The Bodhi Tree, Jivamukti Yoga School, The Santuary in Thailand, Jivamukti, Berlin Germany, Golden Bridge Yoga (where he was also director of the NYC location). Currently he is enrolled in The Four Winds school of energy medicine, he is a certified kundalini yoga teacher, certified Interdisciplinary yoga, Certified Health Coach from the Institue of Integrative Nutrition, also holds a Masters in Transpersonal Psychology with a concentration on health and wellness from the Institute of Transpersonal Psychology (Sophia University, Palo Alto, California along with a Masters in Education from the City University of New York, trained certified chef and committed life long learner. Born in Africa, Sarab Deva began Kemet studies 17 years ago, developing a deep respect and skill for the healing produced using altered states of consciousness. In 2008 she discovered plant medicine. 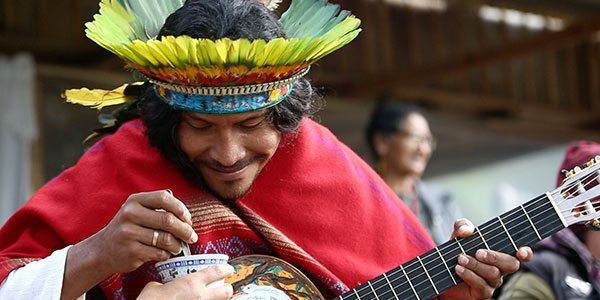 For the past eight years, Sarab Deva has since dieted various medicinal plants whereby she acquired healing songs called Icaros, and facilitated more than 1000 plant medicine ceremonies. These vocal songs are used for sound healing during her ceremonies. Her training accelerated over this period, as she continued working with various Shipibo and Q’ero Shamans in Peru. 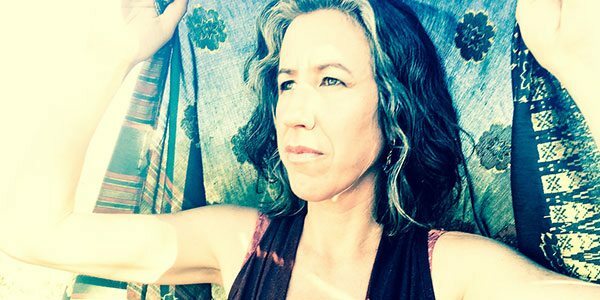 During her ceremonies Sarab Deva will utilize both sound and energetic healing to facilitate the plant medicine experience. 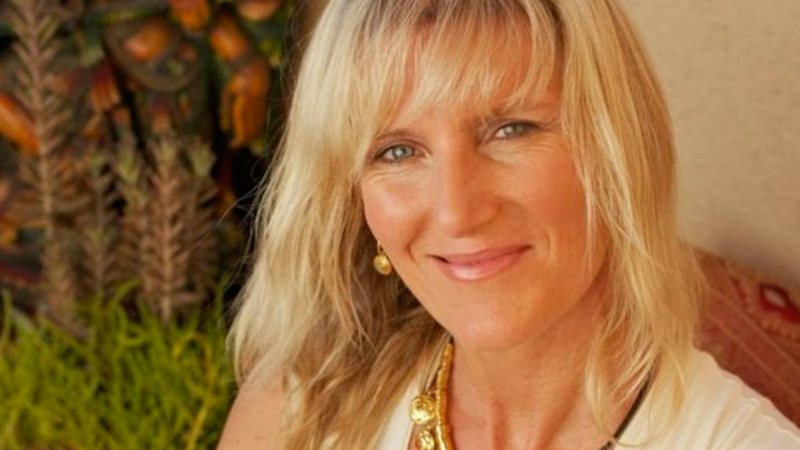 She is also a yogi and certified Kundalini Yoga Teacher and has a degree in Psychology with Clinical Hypnosis. Sarab Deva brings the wisdom of the Vedas into her ceremony space along with a well developed understanding of the Western psyche. The guided plant medicine experience is one of five core programs included in every guest’s stay while at Rythmia. Naturopathic medicine has been used for thousands of years, in countless cultures, to help humans heal, grow, learn, and better understand the world around them. Now western science is finding that plant medicines have the capacity to heal emotional, physical, and spiritual ailments, restore mental functionality, and guide develop spirituality, purpose and lasting happiness. Rythmia’s groundbreaking plant medicine program is administered under the direction of a physician in the safest, most comfortable and attentive conditions possible. Once guests are cleared to participate in the program, they are taught and prepared on how to resolve any internal “blocks” serving as barriers to happiness and physical well being. 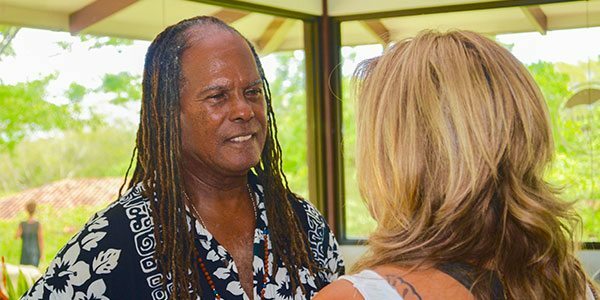 The plant medicine experience and results are based on participant’s willingness to change and ability to be open to the healing benefits of the medicine as led by master plant medicine healers and guides including Taita Juanito, Tara Boyce, Sarab Deva, Steve Ferrang and Brad Recktenwall. A plant medicine experience is truly personal, deeply significant, and emotionally powerful for those who participate. During the process, you will know greater self awareness and connection to your inner self. The plant medicines will empower you in resolving past traumas, removing mental and emotional blocks, and understanding the significance of certain events that have occurred in your life. Plant medicine will help you move ahead in your life in a meaningful, purpose ­driven, and healthy way which enables personal success and happiness. This Cleanse is Written in the Dead Sea Scrolls! After the Cleanse you are rare in the world. You have fewer worms, parasites, mucus, ropes, pepper stems, metals, chemicals, pills, liver and gallbladder stones, and other assorted lifetime accumulations than most people you know. Your sugar, blood pressure and cholesterol levels are normal! Your skin looks radiant and you remember your glow! It’s okay to be the one you have been waiting for, if not you, then who; if not now, then when? You can do it later, maybe? What if later never comes? Agape’s local community outreach programs feed the homeless, serve incarcerated individuals and their families, partner with community service organizations active in children’s schools and homes for youth at risk, support the arts, and advocate the preservation of our planet’s environmental resources. Agape’s global humanitarian programs provide food and retraining to schools, libraries, orphanages, hospitals, clinics, homes for unwed mothers, and provide micro-loans, financial support during natural disasters, and human advocacy. Locations served range from 8 African countries to Afghanistan, Bosnia, Columbia, Ecuador, India, Iraq, Kosovo, and Sri Lanka. An eminent representative within diverse religious traditions, in February 2012, Dr. Beckwith addressed the United Nations General Assembly as part of its annual World Interfaith Harmony Week. As co-founder and president of the Association for Global New Thought, Beckwith is chair of the Gandhi King Season for Nonviolence which was launched at the United Nations in 1998 and is currently active in more than 100 U.S. cities in 40 states and in 10 countries. About its mission the Dalai Lama has said: “Both Gandhi and Martin Luther King are inspiring examples of the power and truth of nonviolence and the actions that arise from them. The Season for Nonviolence is a very good tool to remind us of their witness, and also the large unfinished work we have together in transforming awareness on our planet.” AGNT has also been privileged to be the convener of three Synthesis Dialogues with His Holiness the Dalai Lama of Tibet. In 2013, Dr. Beckwith’s book, Life Visioning, received the prestigious Silver Nautilis Award in the category of religion and spirituality, as well as a Silver Nautilis Award in the category of creativity for his book and music CD combination, TranscenDance Expanded. Beckwith is a sought after meditation teacher and facilitator of conferences and seminars on the Life Visioning Process™, which he originated. He is the author of The Answer Is You, 40 Day Mind Fast Soul Feast, Inspirations of the Heart, and A Manifesto of Peace. He has appeared on Dr. Oz, The Oprah Show, Larry King Live, Tavis Smiley, and in his own PBS Special, The Answer Is You. Every Friday at 1 pm PST, thousands tune into his radio show on KPFK, Wake up – The Sound of Transformation, and his Wednesday Hay House Radio Show at Hay House Radio.com. These core structures are taught everyday here at Rythmia with one structure being the focus of each day’s schedule. Everything you will learn while participating in the Life Transformation program will coincide seamlessly into the other activities and programs at Rythmia. For your entire stay you will be able to fully realize how living in harmony with these principles will change your life forever. Rythmia Life Advancement Center is at its core a place for great spiritual understanding and transformation. We believe that if you can heal and resolve spiritual maladies then you will be able to fully commit to the healing of your other issues. Our Life Transformation program is meant to teach you and provide greater insight into to transforming your everyday life. While experiencing all that Rythmia has to offer it will be of tremendous advantage for all guests to experience the Life Transformation curriculum. People who go to Rythmia are there to find a greater sense of purpose and well being, choosing in this moment to become more than what you have been in the past, to become more of who you truly are. Our sole objective at Rythmia Life Advancement Center is to assist in accelerating that growth to help you live a more awakened and purposeful live. 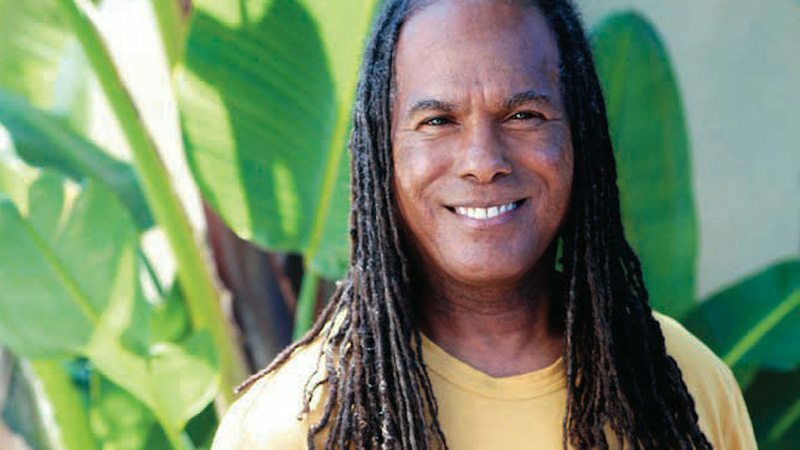 It is a great honor for us to be able to present Dr. Michael Bernard Beckwith of Agape International Spiritual Center and world famous spiritual teacher, who will be leading our Life Transformation program with “The Answer is You.” His teachings and principles will be cornerstones of the success in personal development you achieve at Rythmia and forever onward. The Dead Sea Cleanse is the most complete hydrotherapy treatment in the world. 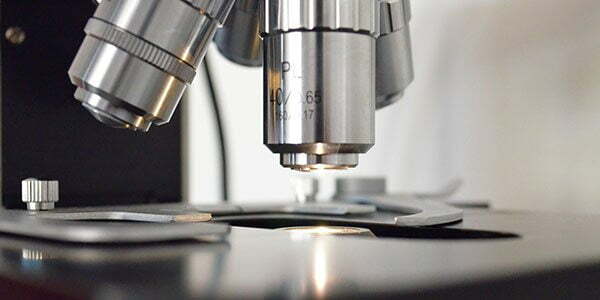 Rythmia LAC is a holistic health center meaning we address the ‘whole’ of each and every individual. The Dead Sea Cleanse is the most progressive treatment in the world for cleansing the internal organs and digestive system. It is of paramount importance to have a clean vessel and heal the physical body to which your spiritual self can reside. Scientific evidence has shown that what we put in our body and the microorganisms that inhabit our body play a monumental impact and how we feel and act. The Dead Sea Cleanse is a 12 day complete cleansing process that addresses the body, mind, and spirit by helping your physical body catch up with your consciousness. Rythmia offers you this world famous cleanse alongside all of our other therapies at no additional cost! At Rythmia, we are utilizing an enhanced program which combines many age-old processes and techniques to offer you one of the most comprehensive and amazing premiere cleanses there is in the world. Due to Meghan Pearson’s extensive experience with physical health and nutrition, this program is truly one of a kind. The Dead Sea Cleanse can be your jumpstart to a new healthier life full of energy and vitality with a clean slate to employ better diet and life practices. Shivanter Singh is a an Integrative Nutrition health counselor specializing in health and wellness. He has degrees in restaurant management, education, and transpersonal psychology. As a certified health counselor and Kundalini Yoga instructor, Shivanter Singh offers cleanses and classes involving healthy lifestyle strategies to nourish and support people emotionally, physiologically, and spiritually. He has developed his healthy lifestyle cleanses based on the teachings of Yogi Bhajan, teachings that encourage daily Kundalini Yoga and meditation, healthy cooking strategies, an understanding of acid/alkaline diet, and yogic herbal therapy. A food industry professional for more than 30 years, Singh is the former general manager of Omega FoodWorks at Omega Institute. 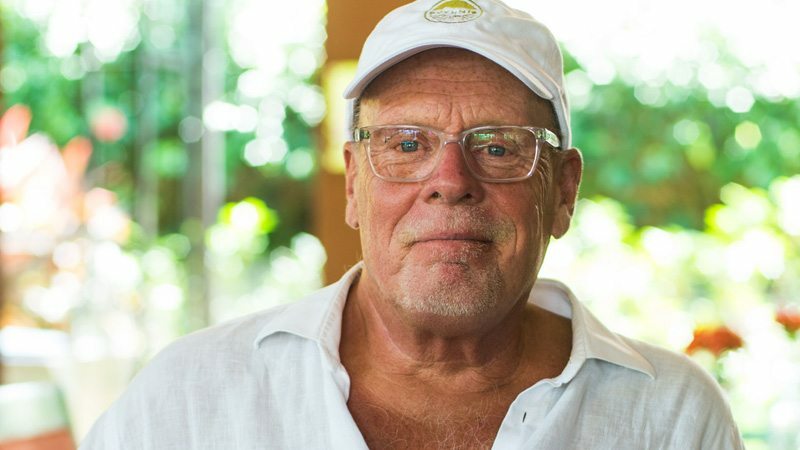 Owner of Naked Foods in Costa Rica, providing foods meant to maximize healthy lifestyles, he is also director of The Village, a nonprofit in Nosara, Costa Rica, focused on creating and supporting community-based enrichment programs for local families and children. 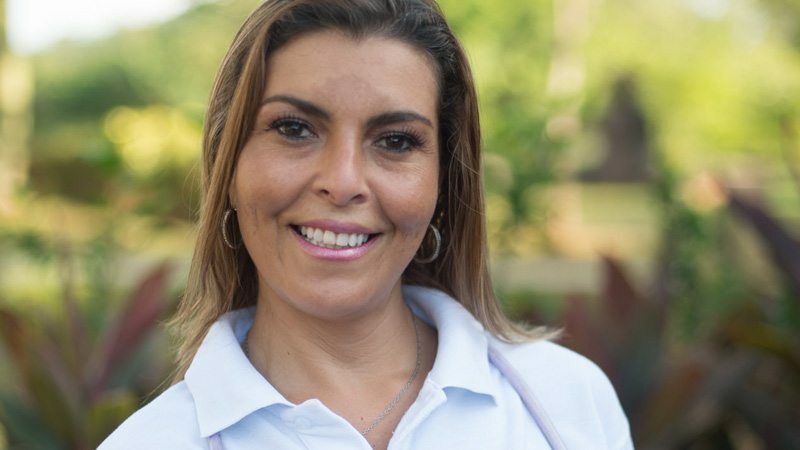 Dr. Vanessa Grillo Granados has more than 15 years of experience working as a medical doctor. She is focused strongly on wellness and preventative care, and believes that the foundations of health are based in the physical, emotional, spiritual, social, and environmental factors of every individual. Dr. Grillo addresses the mind, body, and spirit of each person by using traditional and complementary therapies. When these aspects are balanced, healing is realized naturally. NATUROPATHIC PLANT MEDICINES HAVE BEEN USED FOR THOUSANDS OF YEARS IN COUNTLESS CULTURES TO HELP HUMANS HEAL, GROW, LEARN, AND BETTER UNDERSTAND THE WORLD AROUND THEM. Here at Rythmia we have also experienced tremendous personal growth and greater well being because of these plant medicines. It is because of this that we are bringing them now to you. It changed our lives so let it change yours too, we promise you will be so grateful you did. All guests will meet with a Physician who will determine if plant medicine is the correct option for them and clear them to participate in the Naturopathic Plant Medicine program. We use a wide variety of different naturopathic plant medicines including but not limited to:Aloe Vera, Black Walnut, Cat’s Claw, Dong Quai, Ginseng, Lemon Balm, Passionflower, Sage, Valerian and so much more. Movement is life for Shiva Rea, M.A, global yoga teacher, activist, and innovator in the evolution of vinyasa yoga around the world from large-scale festivals and conferences to unplugged retreats. At Rythmia, movement and growth are the primarily outcomes which we are helping individuals achieve in their physical, mental, and spiritual lives. Yoga is a discipline known worldwide for it’s amazing physical and mental benefits through its tandem use of exercise and meditative practice. The yogic practice is such an amazing tool for transformation that we have chosen a world famous specialist to guide our yoga program. Rythmia is blessed to welcome the amazing Shiva Rea into our space to sponsor our on site world-class Prana Vinyasa yoga practice included for free in all programs. Yoga practice is a vital part of the everyday activities at Rythmia and we encourage all guests to take advantage, no matter your comfortability with yoga, as it is for both beginners and experts. Multiple classes occur throughout the day and at times where every guest, no matter the program, will be able to attend for no additional cost. By submitting the information above, you agree to the our terms of service.